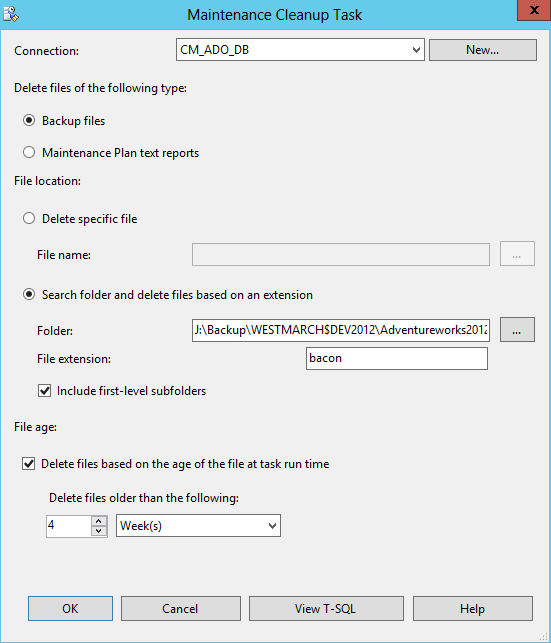 The Maintenance Cleanup Task removes artifacts from maintenance plans, backups, reports, etc. 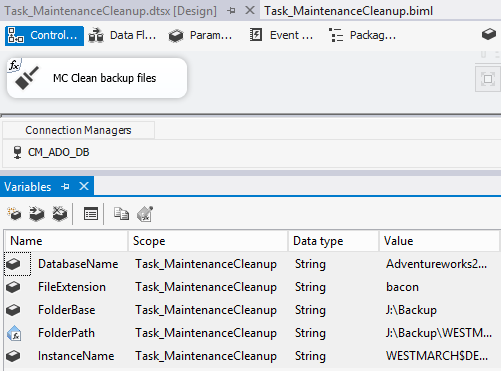 As with other Maintenace Tasks, this requires an ADO.NET Connection Manager. A package is created with Variables to control the FileExtension and FolderPath that are removed. I'm basing the three Variables that build my FolderPath variable based on the default output of Ola's Maintenance plans. Great googly-moogly, someone's attempting to get rid of all the bacon! Well, at least any Backup files that are in the first-level subfolder, with an extension of bacon, that are older than 4 weeks. As you can see, I've applied an Expression to control both FileExtension and FolderPath based on our user Variables.